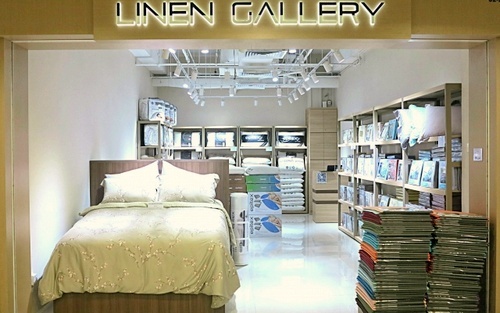 Linen Gallery by Epitex, which also operates under the name Epitex, has eight stores in Singapore, one of which is located at Hougang Mall (90 Hougang Avenue 10). Established in 1997, Epitex offers high quality linens and beddings that promote good sleep, sold at affordable prices. The available linens are made from natural fibres that are extracted from bamboo or cotton, and sold under two main brands – the mainstream Epitex and the niche Crescent Dale – with each having its own distinct style and characteristics in terms of design, function, as well as finishing. Cressent Dale is a brand name that was created by Epitex for the ultimate luxury collections of linens, showcasing style and premium quality. The Cressent Dale label features fashinable designs in terms of prints selection and colour blending, always in line with the current trends, as well as premium yarn, such as TENCEL and MODAL, with at least 800 thread counts for exquisite softness and comfort. At the shops, you can also purchase bedding accessories, which, for the Cressent Dale range are bed sets and fitted sheets, while for the Epitex label, they include bed sets, fitted sheet sets, pillows, bolsters, mattress protectors, mattress toppers, and quilts. The official Epitex and Linen Gallery by Epitex Facebook brand page is available at www.facebook.com/EpitexHome. Following the Facebook page, you’ll stay updated on the company’s special events, promotions and sales, and other news related to the outlets in Singapore.